The 1950s saw the start of the infamous Space Race, which saw Russia and the U.S. compete to master spaceflight capability. The possibility of exploring space caught the imagination of many across the world, and this was the golden age of science fiction stories and films. 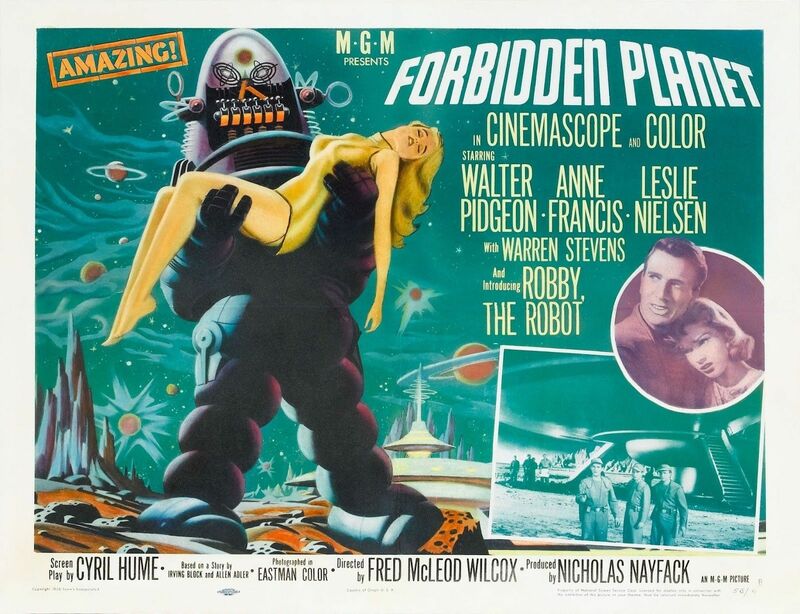 Destination Moon, Them!, Invasion of the Body Snatchers, Forbidden Planet introduced audiences to the possibility of alien worlds and beings from outer space. The Quatermass Experiment appeared on television from 1953, Journey into Space on BBC Radio (also in 1953) and there was clearly an appetite for these sorts of ideas and stories. It was perhaps then, inevitable, that this fascination would inspire the British seaside holiday during its heyday. Indeed, the seaside holiday had become a national institution in the twentieth century, enjoyed by people across Britain from all different walks of life. 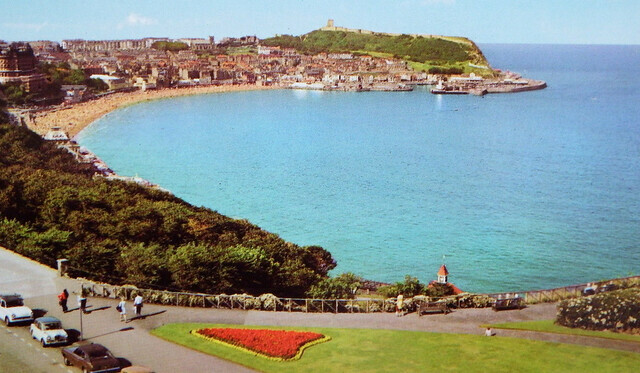 1950s Scarborough was at the centre of this boom, and had been one of the country’s most popular and best known resorts for a considerable amount of time. 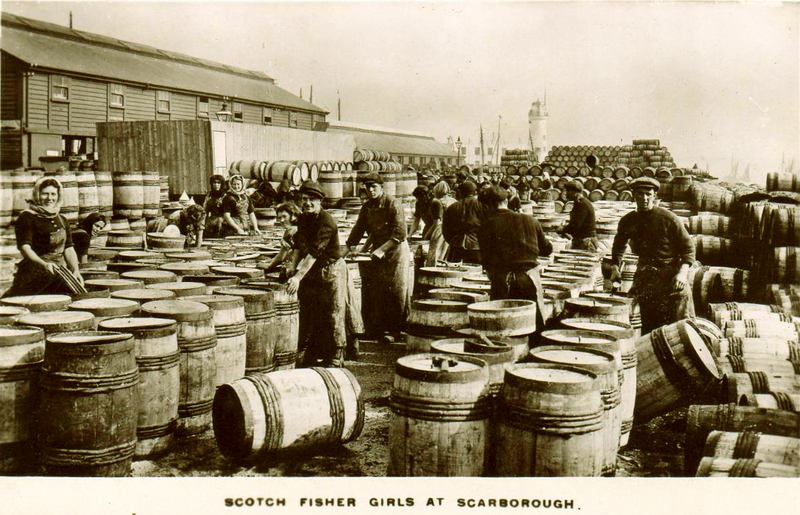 A site – the town’s West Pier – was quickly identified and permission secured from the Scarborough Corporation. 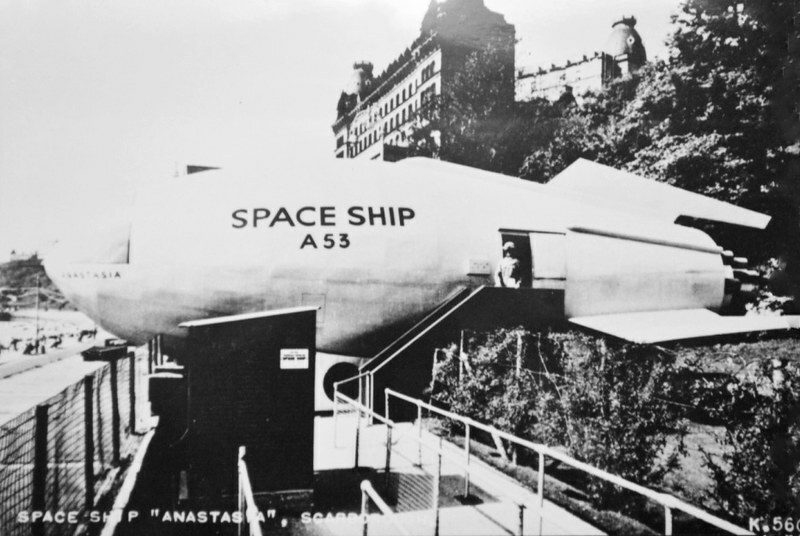 The space-ship was to be 60ft long and 20ft high. However, the town’s fishing community were less convinced by these ambitious plans. 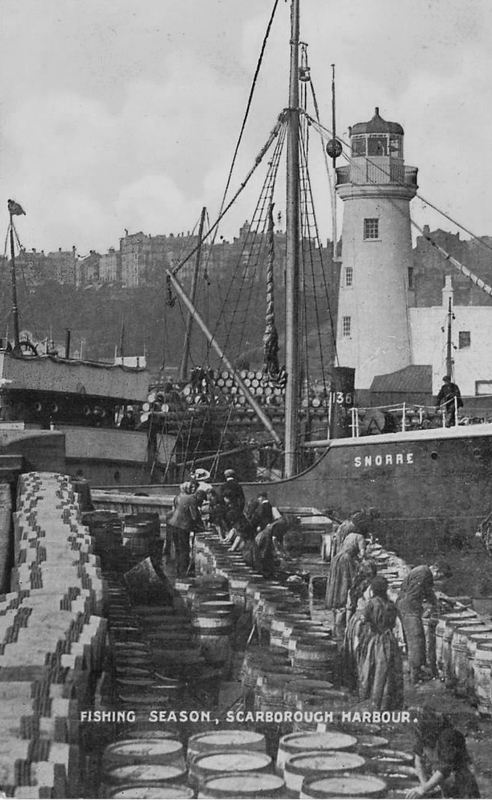 Believing that the proposed attraction would ruin their place of work on the West Pier, they launched a staunch opposition. In February 1953, Mr. R. T. Blogg, secretary of the Scarborough Inshore Fisherman’s Society, sent a letter to Mr W. Alan Whytock, district inspector of Fisheries, Hull, protesting against the proposal for a £6,000 space-ship on the West Pier for holidaymakers. Mr Whytock forwarded Mr. Blogg’s letter to the Minister of Agriculture and Fisheries, Sir Thomas Dugdale. Ultimately, in one sense at least, the appeal was successful. 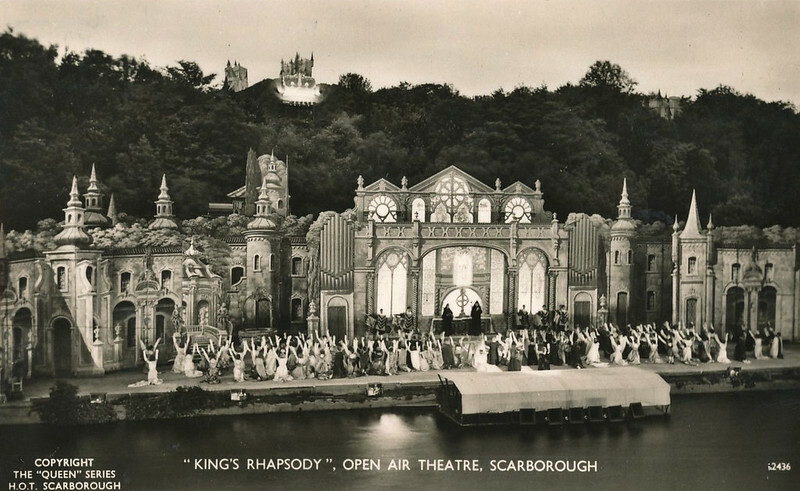 The West Pier was ruled out as a potential site, but the space ship still made a timely arrival in Scarborough. It was instead placed at the Windmill site in time for the summer season of 1953. 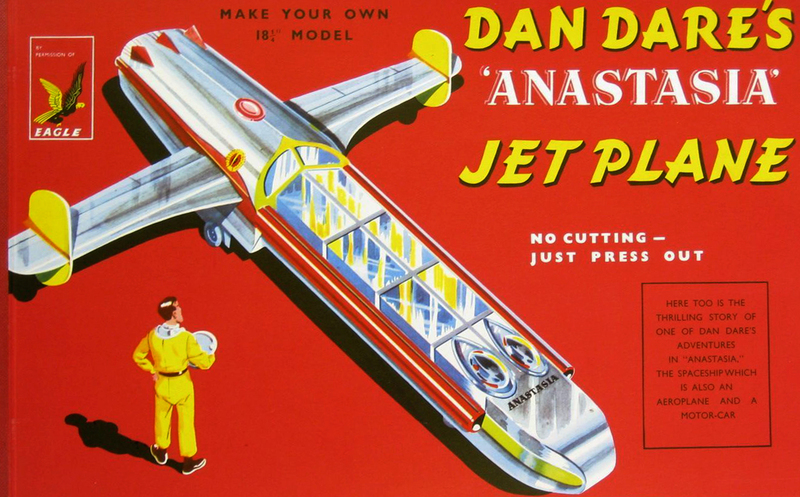 Nicknamed Anastasia, the spaceship was, in part, modelled on a legendary, but fictional, craft that featured in the Dan Dare stories. Dan Dare was a science fiction hero – he starred in countless comic strip tales as a dashing chief pilot of the Interplanet Space Fleet during the 1950s and 60s. According to the articles in newspapers at the time, this was not the only space ride in Britain. As well as the one in London, which had inspired Mr. Pannell, there are mentions of similar rides in Leeds and Hove. They were also known as ‘Dan Dare’ rides, and might be considered as early precursors to the modern day simulator ride, in which audience seating moves to simulate participation in a projected film. 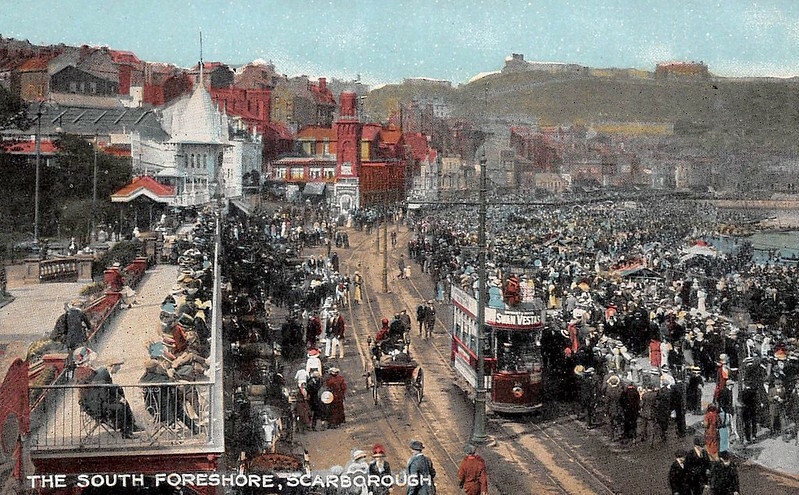 Do you remember this ride in Scarborough? Share your memories below. 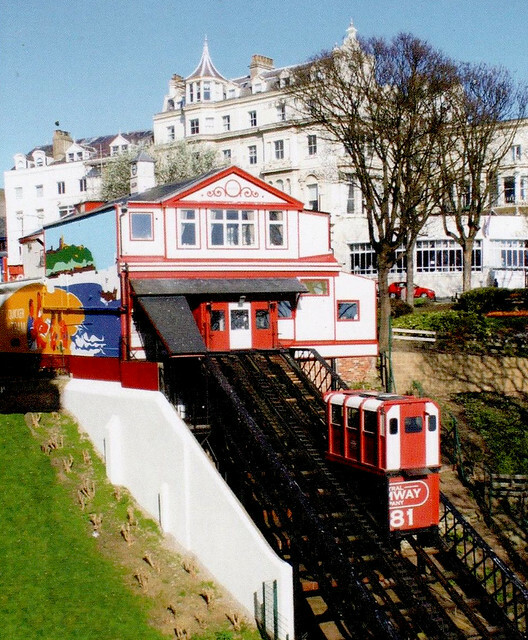 Scarborough currently has two functioning cliff lifts, or funiculars, as they are otherwise known. One is located near the Spa, and the other at St. Nicholas Cliff, taking visitors from the seafront to the shops. 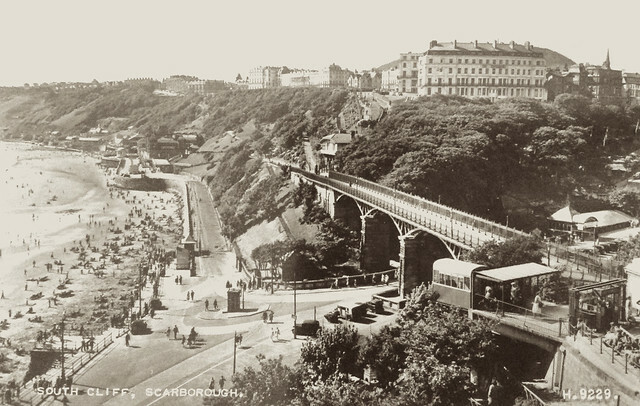 The former has been in operation since 1875, following the creation of the Scarborough South Cliff Tramway Company Ltd in 1873. This organisation was responsible for giving the UK its first ever funicular. 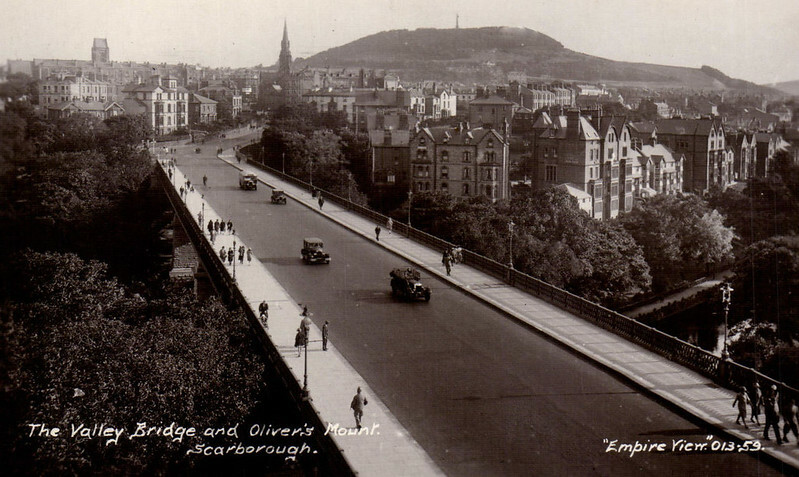 Two cars, running in opposite directions, took passengers from the seafront to the Esplanade and back again, and the route was (and still is) conveniently located near the Scarborough Spa. 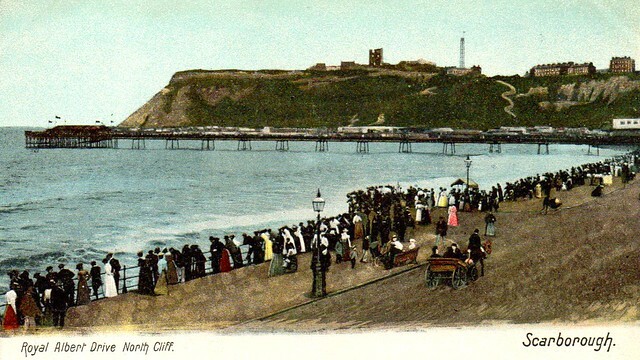 Each car can carry fourteen passengers, and the route became known as the South Cliff Lift. The attraction was bought by Scarborough Council in 1993 and is now fully automatic. 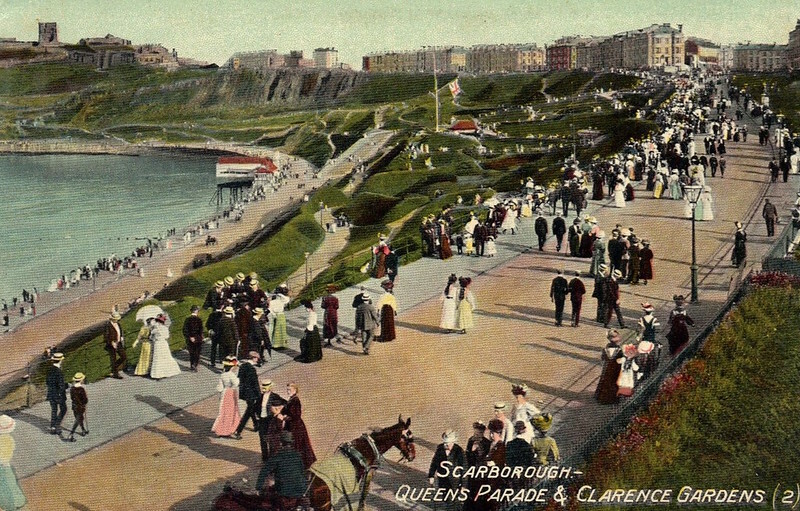 Following the success of the South Cliff Lift, the Scarborough Queens Parade Tramway Company formed, in 1878, intent on creating a similar attraction for Scarborough’s North Bay. This funicular project was, however, fraught with problems. 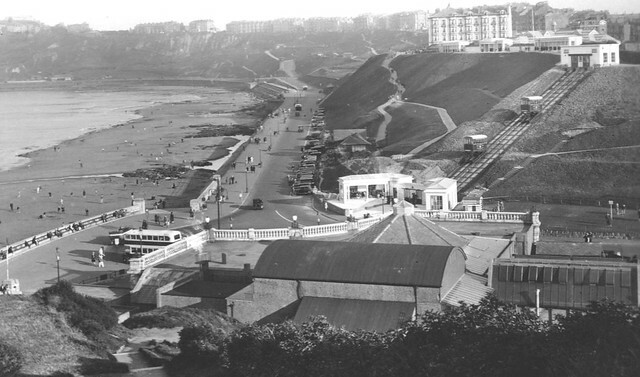 The railway was designed to link the new Promenade Pier (which opened in 1869) to the top of the North Cliff, but its opening in August, 1878, was thwarted when a carriage broke loose. This was followed by numerous accidents and technical failures, and eventually a land slip in 1887, which led to the permanent closure of the route. Eighteen years later, the nearby Promenade Pier also closed, after being destroyed by a storm in 1905. 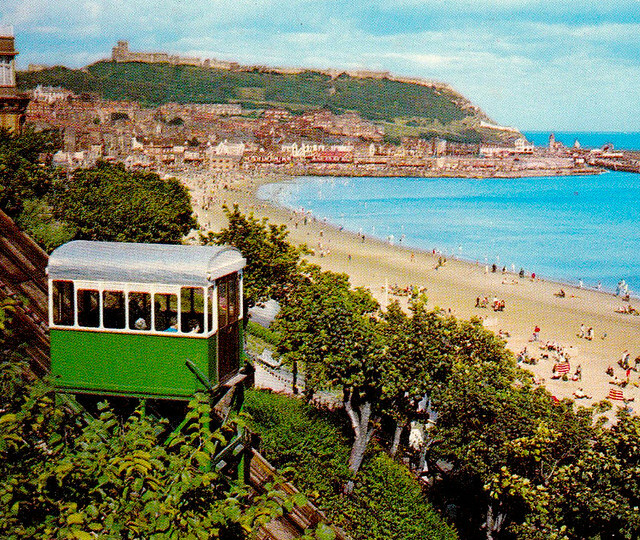 However, it was not all doom and gloom for Scarborough’s funicular railways. The Central Tramway, sandwiched between the Grand Hotel and what is now the Olympia Amusements site, began taking passengers from August 1881. 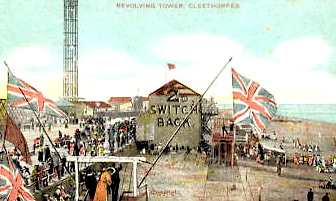 The Medway Safety Lift Company opened the St. Nicholas Cliff Lift on August 8 1929, linking Scarborough’s Grand Hotel with the town’s subterranean aquarium, by then known as Gala Land. Initially the lift did not have a bottom station, and passengers simply boarded carriages directly from the pavement. This lift closed in 2007, as the council could not afford the necessary upkeep costs to meet health and safety standards, and the station has since been developed into a cafe. 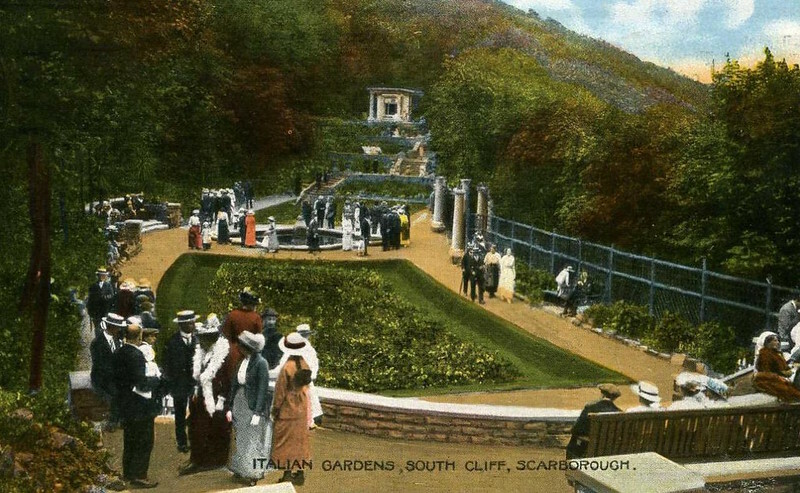 The North Cliff Lift, situated at Peasholm Gap, opened only a year after the St. Nicholas Cliff Lift, and was part of the Scarborough Corporation’s development of the area, which included the opening of the Corner Cafe only a few years previously, and the North Bay Bathing Pool (originally opened as a boating pool in 1935) in 1937. This lift ran until 1996, after which it was eventually dismantled and the carriages placed in storage. 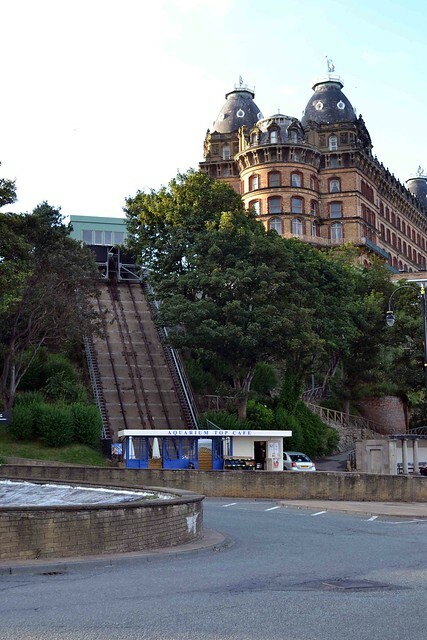 Have you ever used one of Scarborough’s funiculars? Some of Scarborough’s many stunning gardens have already been explored in Part I, including Clarence Gardens, the Italian Gardens and the Rose Garden. This post discusses Valley Gardens, Holbeck Gardens, and a few others. In 1862, shortly after the rennovation of the Spa in the late 1850s, the nearby Ramsdale Valley became home to Valley Gardens. Initially these gardens were known as ‘The People’s Park’. 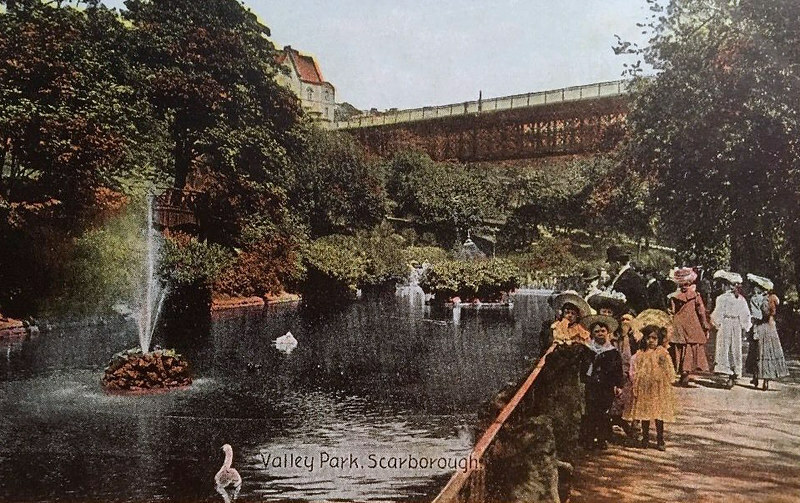 The Scarborough Corporation made the decision to decorate each side of Valley Road, with rockwork, plants and flowers, as well as a small pool, which had previously supplied water to Scarborough’s corn mills, which had closed a decade earlier. Complete with a jet d’eau, lily pond, swans and small island, the final addition came in the form of a skeleton iron bridge, bought by Robert Williamson, or rather rescued, from the River Ouse in York, into which it had fallen. 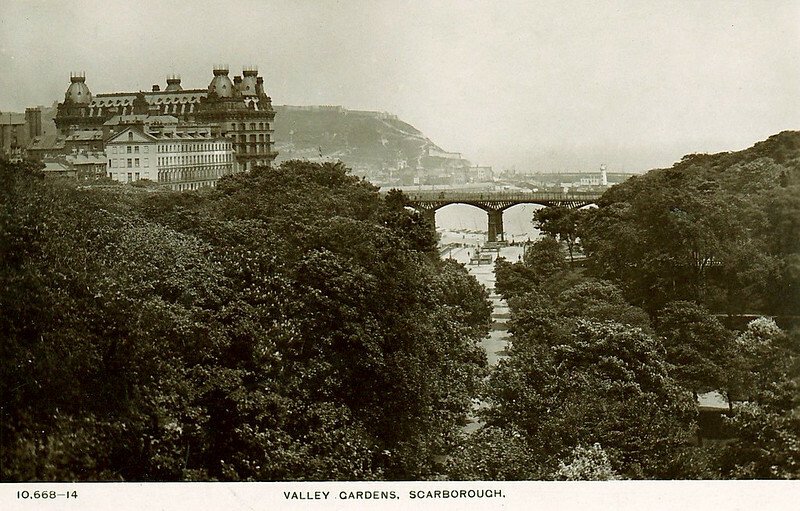 Then known as Lendal Bridge, its reincarnation in Scarborough is now known as Valley Bridge (not to be confused with the Spa Bridge, which connects the Grand Hotel with the Spa). 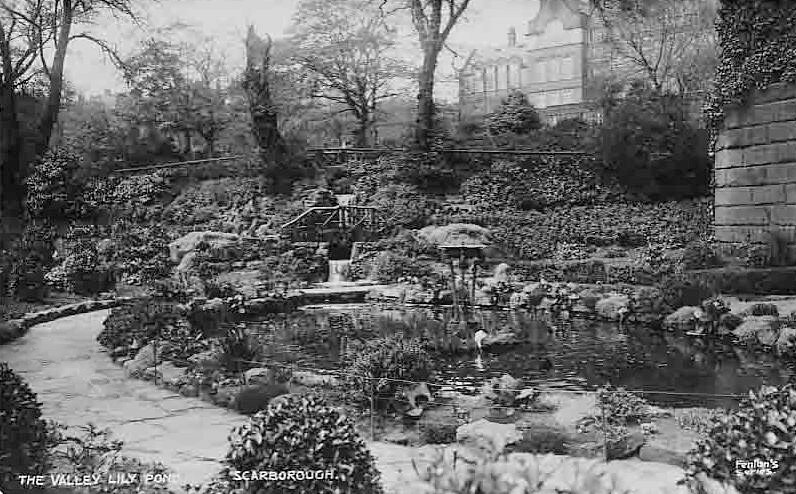 The Scarborough Corporation commissioned Holbeck Gardens in the late nineteenth century, and they were designed by William Skipsey. 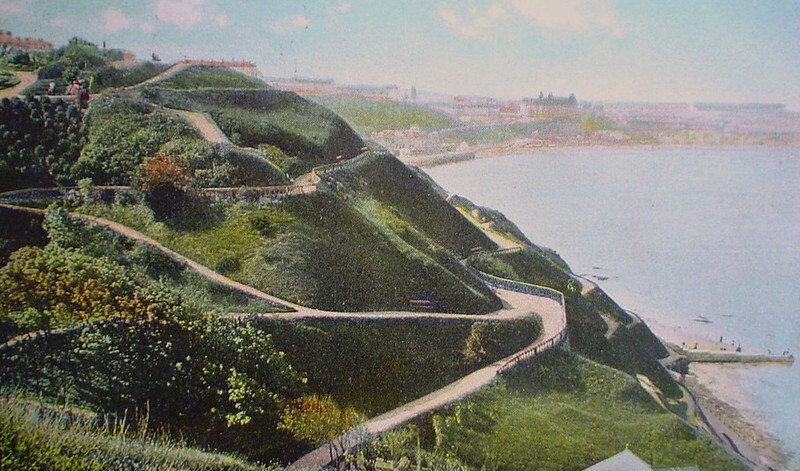 Starting just south of Dickenson Point, the gardens soon encompassed a vast network of winding cliffside paths that stretched all the way to the Esplanade. On the left there is a touching memorial to a fallen soldier, and during the warmer months wild rabbits and squirrels can sometimes be seen on the grassy slopes. The paths lead all the way from the top of the cliffs to the beach below, and offer walkers enchanting views across the South Bay and Spa. However, the entrance to the vast network of paths is located next to the Esplanade. 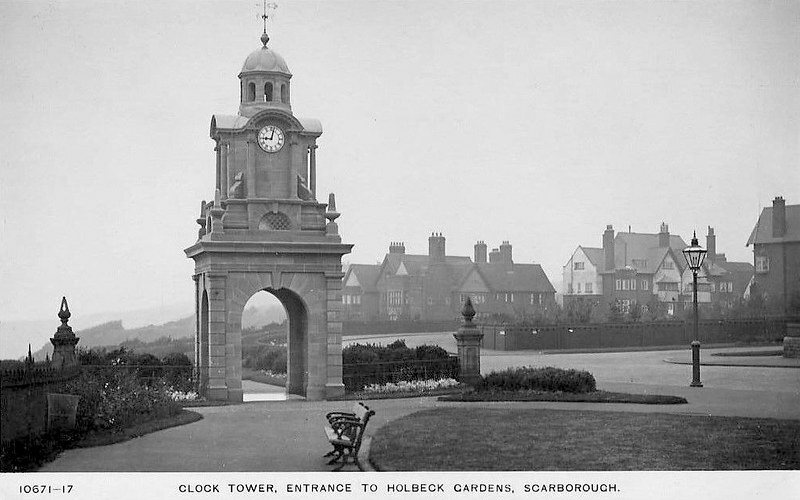 When George V was crowned in 1911, a special clock tower was built on Scarborough’s Esplanade to commemorate the event, and this was then donated to Holbeck Gardens in the same year, by William Shuttleworth. At the end of WWI a putting green was also added close by. Although much of the gardens remains today, relatively unchanged, the furthermost end, closest to Holbeck Hall, has, since 1993, changed dramatically. 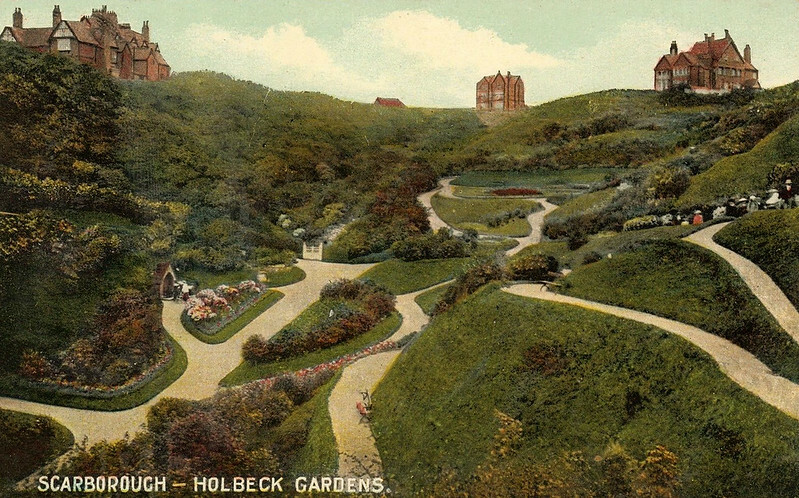 A landslide in 1993 transformed a large part of the gardens, and destroyed nearby Holbeck Hall. Built in 1879, by George Alderson Smith, Holbeck Hall was originally a private residence, eventually becoming a hotel in the twentieth century. The landslide began on June 3rd, following heavy rainfall, which eventually precipitated the collapse of the building two days later. Parts of the hotel fell into the sea, and the remainder was later demolished. Parts of the area still remain off limits to visitors. As well as the clock tower, Alfred Shuttleworth was responsible for the miniature garden on the Esplanade. This intricate little garden features several small buildings and bridges as well as a small stream. All of the above gardens, as well as those featured in Part I, will be covered in more details soon. 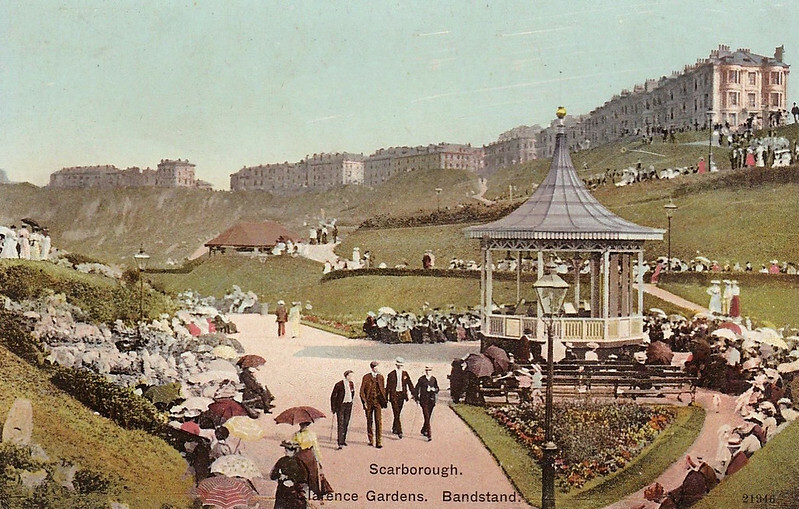 Aside from Peasholm Park, Northstead Manor Gardens and Alexandra Gardens, which have already been covered here, Scarborough has, over the years, boasted numerous splendid gardens. In this post you can enjoy a visual feast of some of the others, whose histories will be covered in more depth soon. 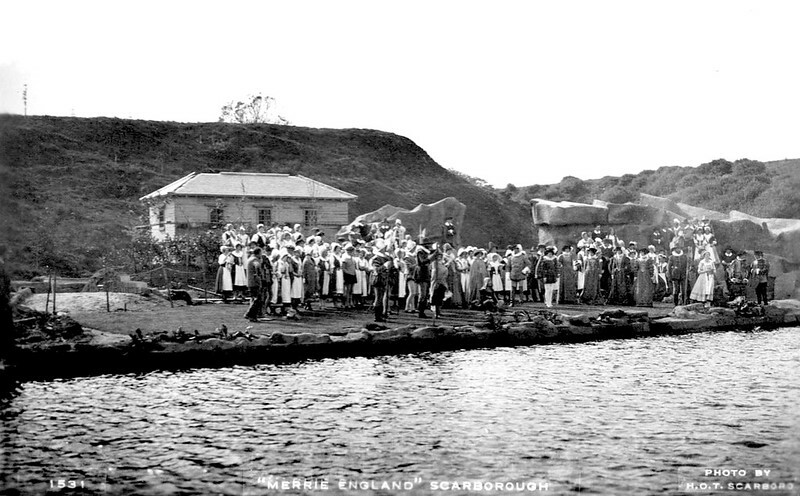 In the nineteenth century, Britain was still coming to terms with the effects of rapid industrialisation, and problems associated with urban growth led public officials across the country to develop public parks. Such places offered respite from gruelling city life, as well as fresh air, flowers and trees. 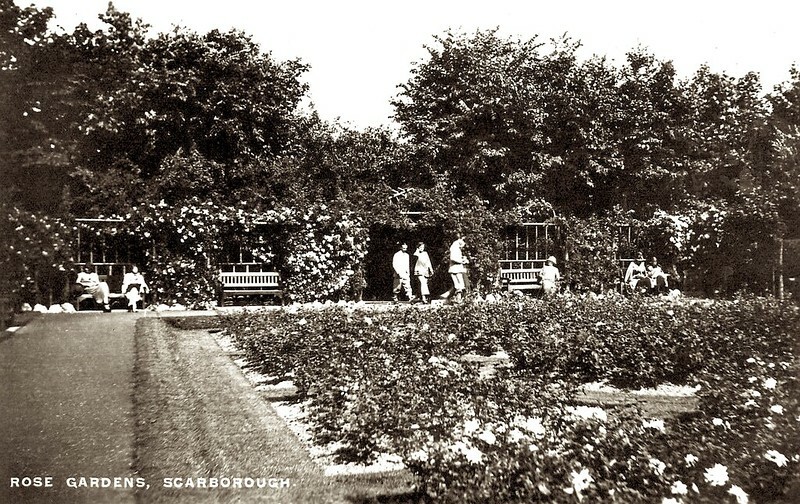 Scarborough was no different, and in the 1800s and early 1900s, a plethora of parks and gardens appeared, including Clarence Gardens. Clarence Gardens was located on the North Bay, overlooking the doomed North Bay Pier. It was laid out by Leonard Thompson, Superintendant of Scarborough Cemetery (1865 – 1911) and opened in 1896 alongside the Royal Albert Drive. 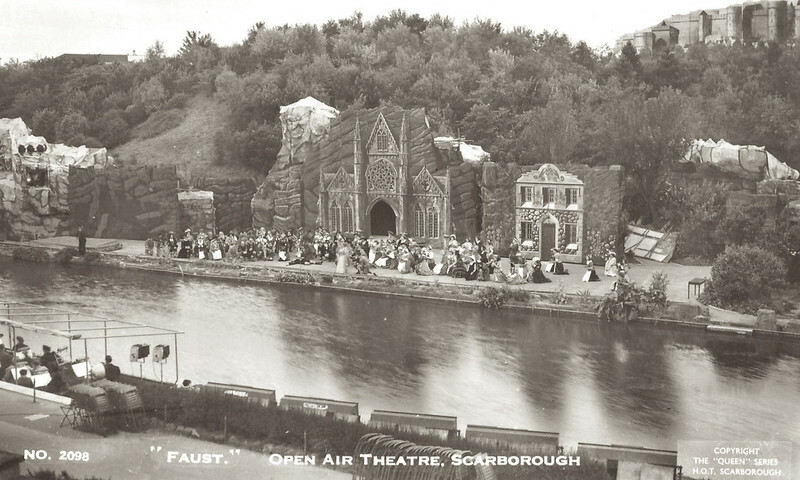 The gardens featured a bandstand and a stage, winding walkways across the cliffs and even a small bridge. 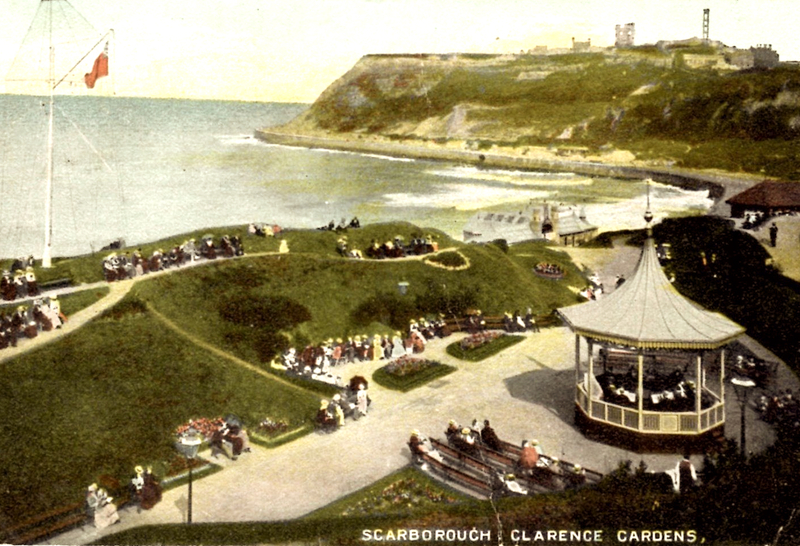 Although the bandstand, much of the seating and the live entertainment are now long gone, the winding pathways remain, and the nearby Clarence Gardens Hotel, keeps the name alive. 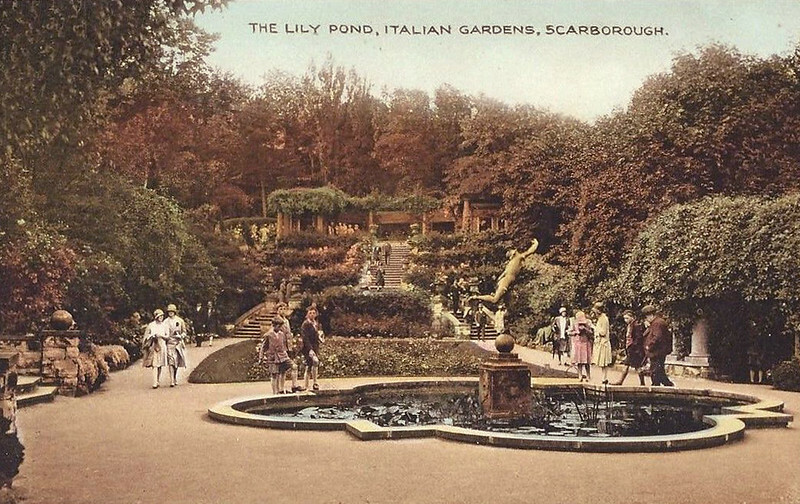 The Italian Gardens were yet another creation of Scarborough’s legendary Borough Engineer, Harry W. Smith. 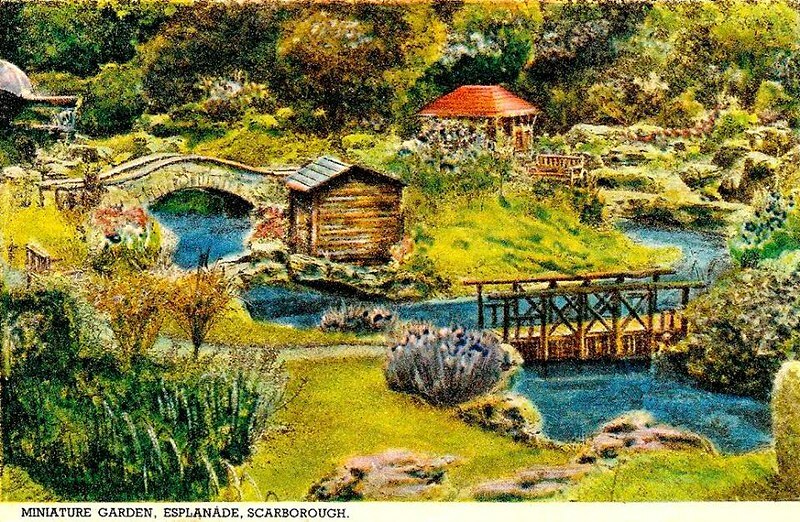 During his tenure he set about transforming areas of wasteland into beauty spots for tourists and locals, and his successes include Peasholm Park, Alexandra Gardens and the South Bay Pool. The centrepiece of the gardens is a lily pond surrounding a pedestal which sports a statue of Mercury – Roman god of financial gain, poetry, communication, and travel, amongst other things. Since 2000 a resin cast has replaced the original statue, but before it was constructed, Smith had one of his staff pose on the pedestal to check positioning and measurements. Two raised platforms at each end of the gardens feature pergola shelters with teak seats, which were added in 1914 and enabled visitors to enjoy views across the garden. Interesting fact – the stone used in the development of this area was excavated from the site of what would later become the South Bay Pool. 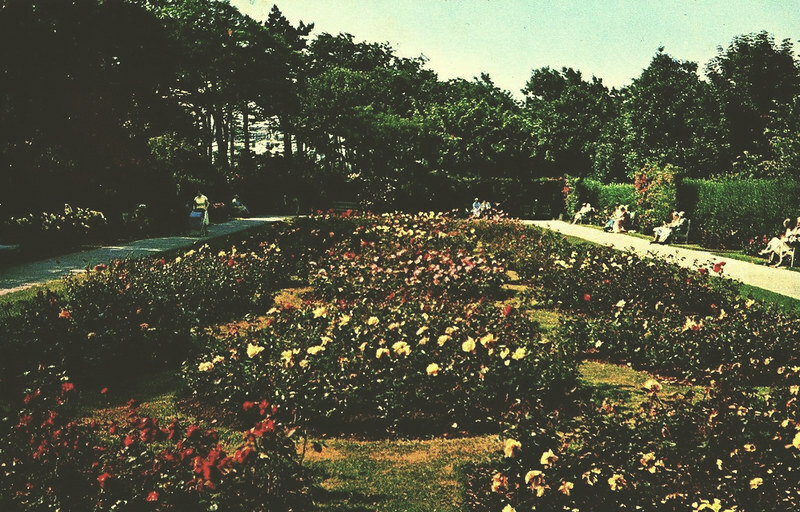 Measuring 57m by 13.4m, the Rose Garden, located close to the Esplanade on the South Cliff, features 32 rose beds, including 10 circular beds in the centre, 18 side beds and 4 corner beds. The garden is sheltered by conifers and deciduous trees and was the subject of a major restoration project, completed in 2015. Originally known as the Belvedere Rose Garden (or, The Large Rosary), the garden was part of a larger site acquired in 1883 by Lord Beeforth. 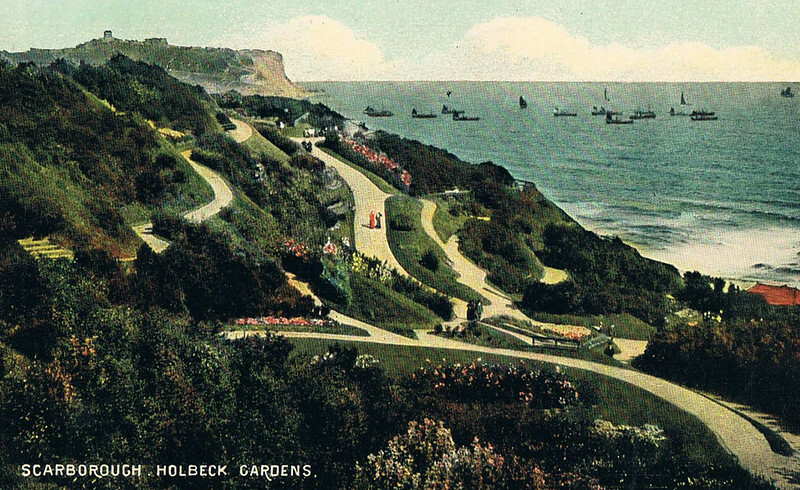 Part II will include Holbeck Gardens and Valley Gardens, and of course, many more pictures of beautiful Scarborough gardens. 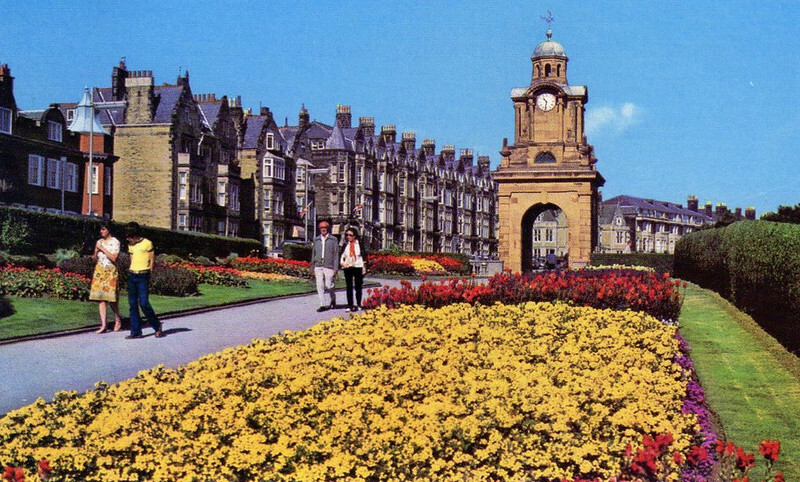 In the heart of Scarborough’s Alexandra Gardens, now a bowling green, Floral Hall once stood. 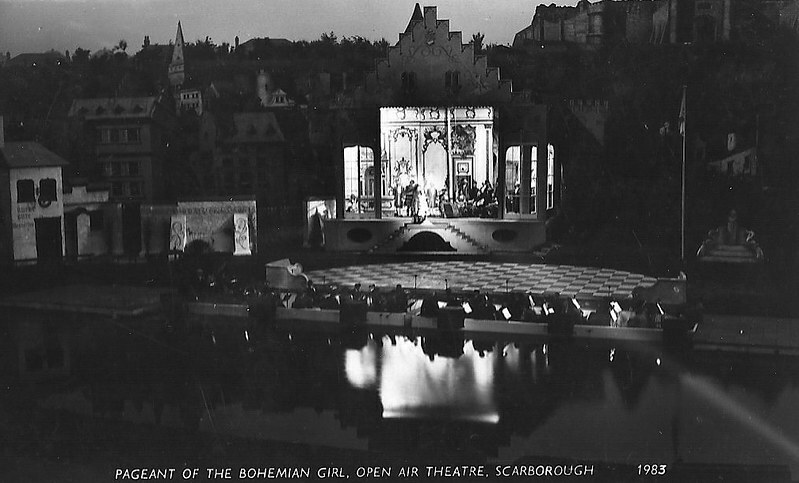 After beginning as an open air home for pierrot performances – then for George Royle’s popular fol-de-rol entertainers, Scarborough’s Floral Hall gained a roof, lost its floral decorations and welcomed a number of big name acts. This post compares a number of the venue’s programmes from the 1970s, with those from the earliest days. These were the times of the summer season, the variety performance and the triumph of British seaside entertainment. 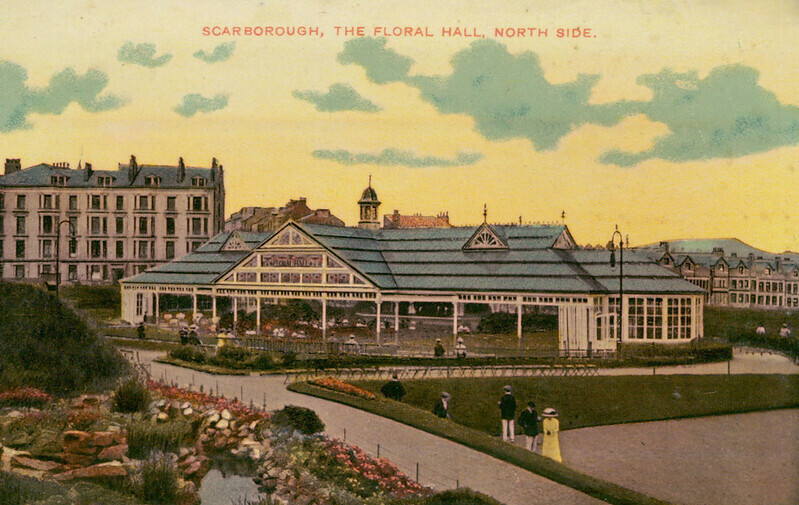 However, the story of Floral Hall begins with pierrots – and Edwardian Scarborough was a good place to be one. 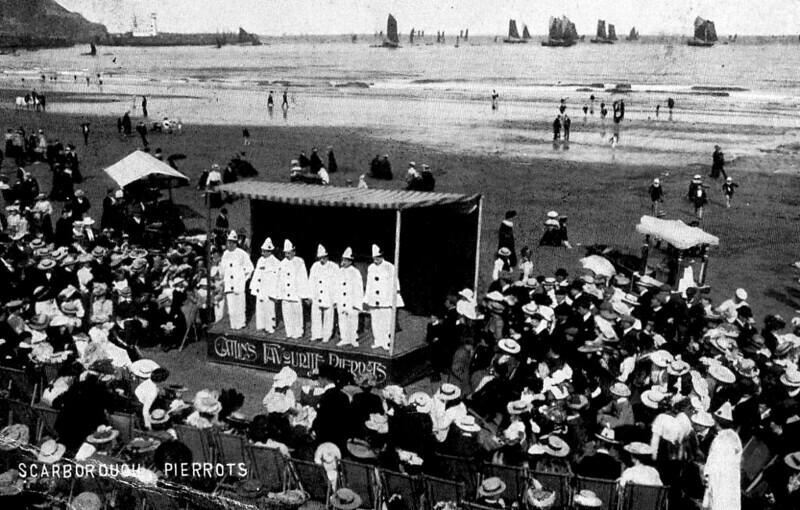 These French and Italian inspired performers dressed in white and performed a mixture of comedy, music and mime, primarily on the beach. 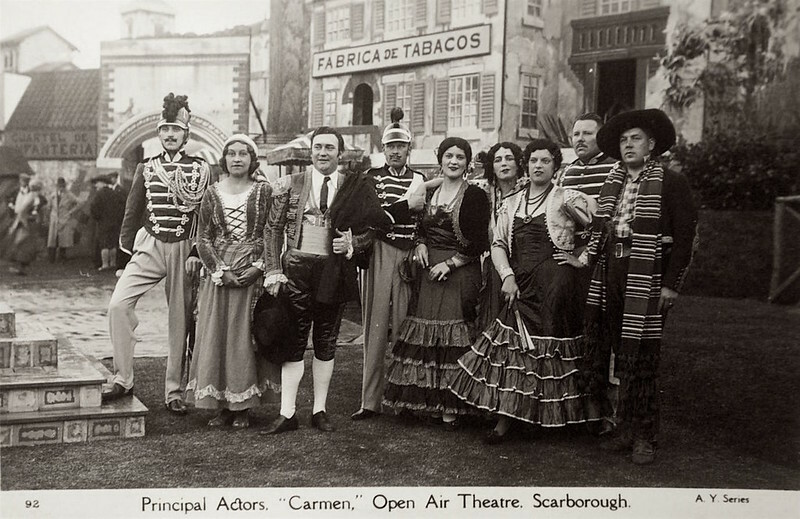 Will Catlin’s pierrots were a huge success on Scarborough’s South Sands, as were Carrick’s Original Pierrots. 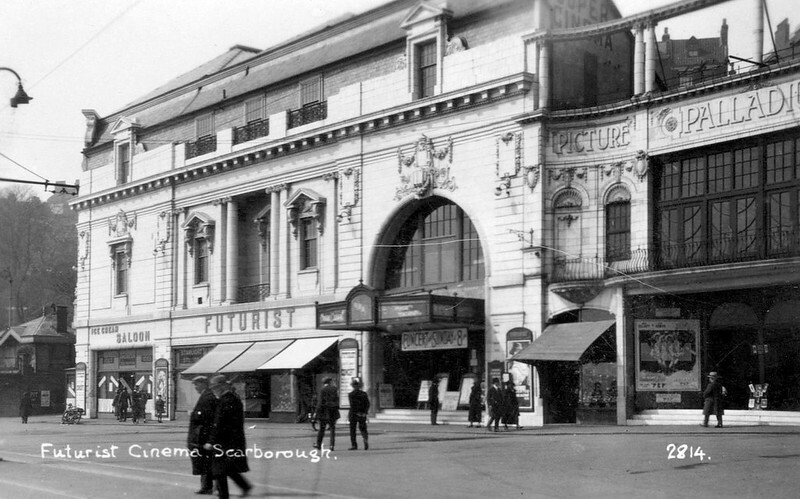 Catlin eventually built the Arcadia on the Foreshore, to showcase these performers, but with the development of cinema, he soon transformed the site into the Palladium Picture House, and the grander theatre that became known as the Futurist. 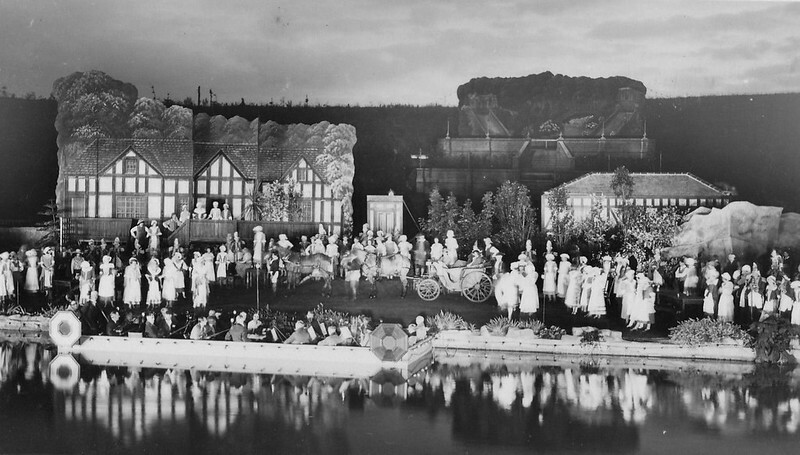 George Royle also led a troupe of pierrots, and when Harry W. Smith – Borough Engineer extraordinaire – set about designing Alexandra Gardens, the open air theatre was to provide a home for Royle’s performers. 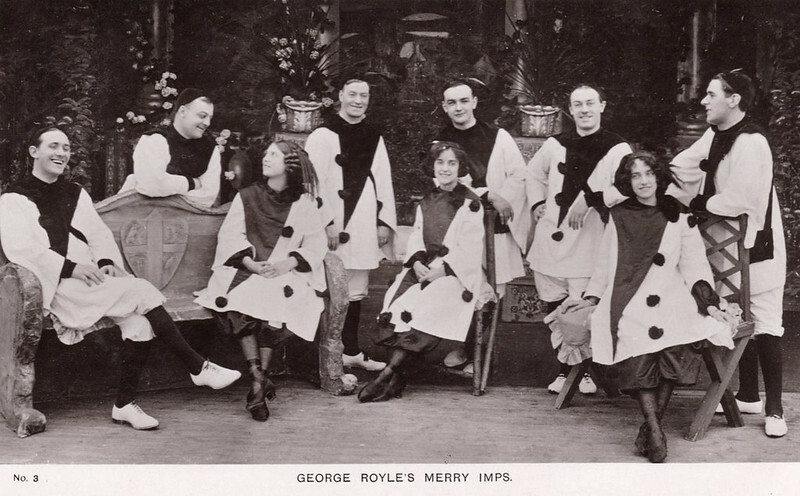 However, Royle quickly rejected the idea of continuing with the pierrot performances, instead preferring his troupe to dress in eccentric period costumes. Top hats for the men and bonnets and crinoline for the women. 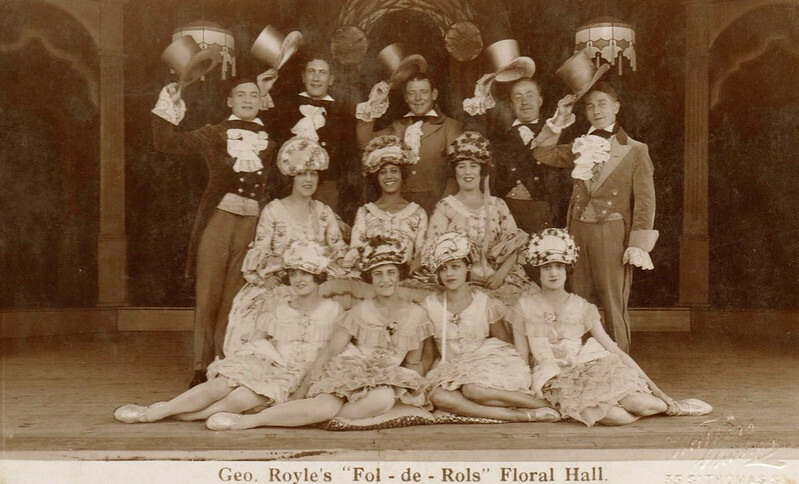 Known as the Fol-de-Rols they were Floral Hall’s original resident act. 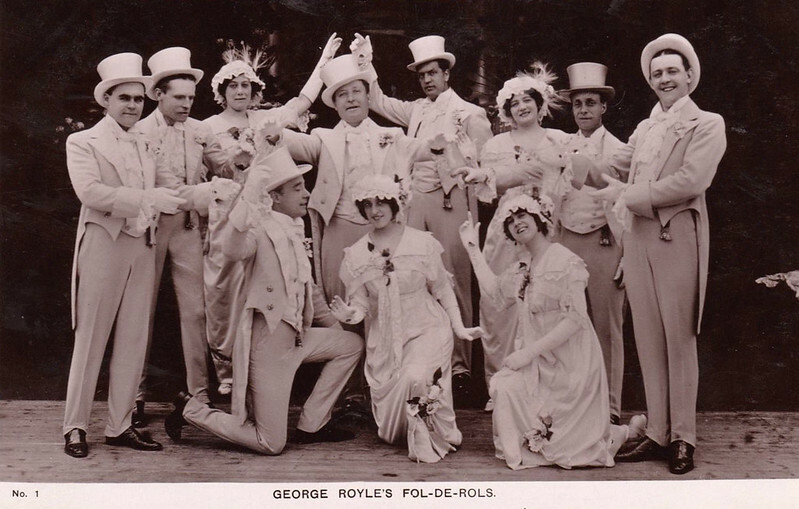 The Fol-de-rols were immensely popular, but WWI changed everything – audiences dwindled (the 1914 Scarborough bombardment was a stark reminder of the dangers of wartime) and George Royle signed up to join the army. When he returned he was invited back to Floral Hall, but rents were rising and tastes were changing – the Fol-de-rols would not return. Fast forward to the 1960s and 70s, and seaside entertainment had been completely transformed. Gone were the old fashioned music hall acts, replaced by an altogether more modern form of variety. Furthermore, another huge influence was television – which was where many budding performers made their name. Talent shows such as Opportunity Knocks and New Faces provided many big breaks. Programmes from Floral Hall provide a fascinating insight into the seaside summer circuit at this time, and how stars of the day broke into the entertainment industry. The Krankies are a Scottish husband and wife duo. 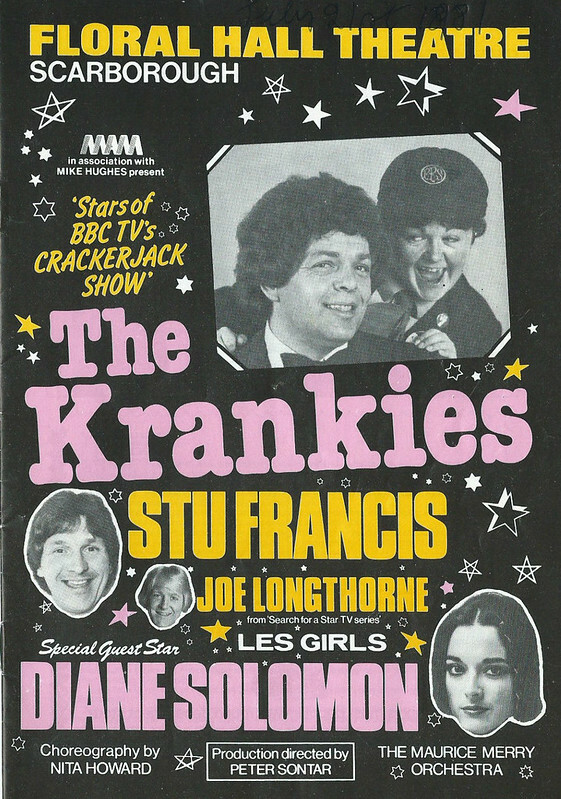 They starred in TV’s Crackerjack, amongst other things, and Stu Francis, is another comedian who also featured in the same programme. Joe Longthorne, a singer from nearby Hull, found fame in TV shows such as Junior Showtime, and Search for a Star, while American singer Diane Solomon, made a name for herself on the BBC. 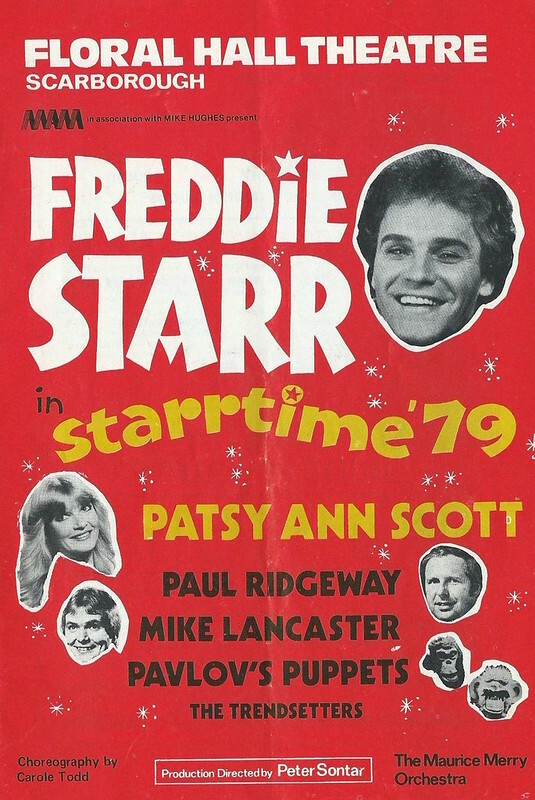 He was joined in Floral Hall for the 1979 summer season by a puppet show, Mike Lancaster (another comedian), and Patsy Ann Scott, known for her appearances on 1970s TV shows. The Maurice Merry Orchestra are mentioned on most of the programmes here, as is the director Peter Sontar. Les Dawson, like Freddie Starr, benefitted hugely from an appearance on TV talent show Opportunity Knocks, and was a comedian famed for his ‘mother-in-law’ jokes and piano playing. Dougie Squires, on the other hand, was a contemporary version of George Royle or Will Catlin. Instead of leading a troupe of pierrots, he created a singing and dancing group called The Young Generation, who were TV regulars in the 1960s and 1970s. Second Generation was an ill-fated attempt to reform the group. As for Bobby Bennett, he presented Junior Showtime, another TV show with strong Floral Hall connections. Finally, Kenneth McKellar was/is a singer who represented Britain in the Eurovision Song Contest in the 1960s, and made numerous television appearances. 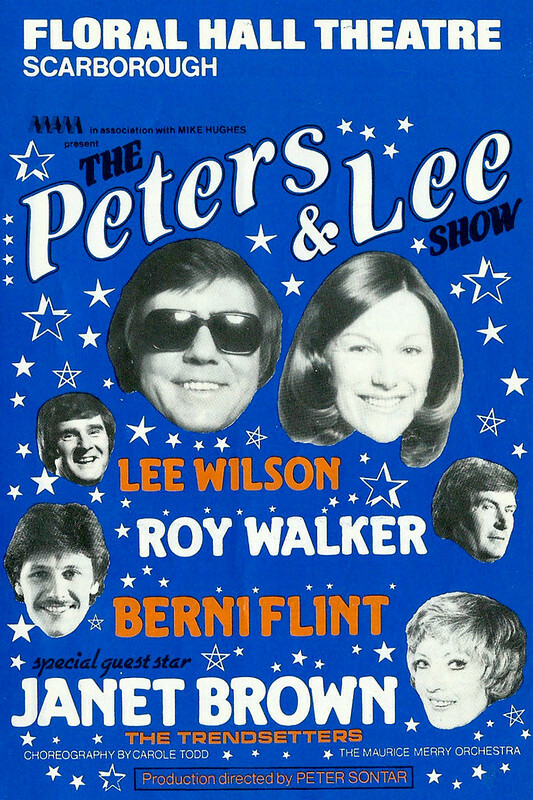 1970s folk duo Peters & Lee were Opportunity Knocks alumni – indeed, Floral Hall seemed to recruit heavily from TV talent contests, and featured in the Royal Variety Performance of 1973. Roy Walker is today perhaps best known as the former presenter of Catchphrase, the popular long-running TV gameshow. but he started off as a comedian, and yet another TV talent show alumni – New Faces this time. Lee Wilson was also a comedian and another former New Faces contestant. Singer-songwriter Berni Flint had a record number of wins in Opportunity Knocks, whereas Janet Brown was an actress and impressionist famed for her impressions of Margaret Thatcher. 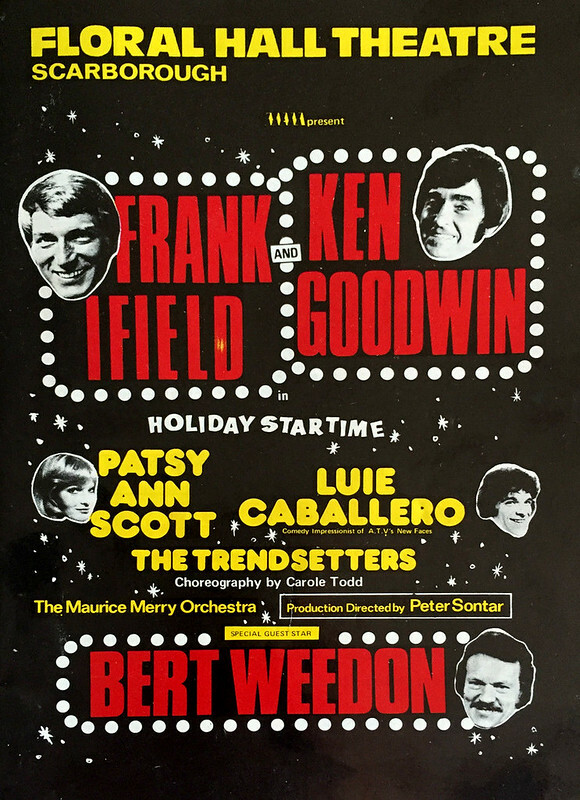 In this final programme, Frank Ifield – a singer who represented the UK in the Eurovision Song Contest. He came a respectable second in 1962, during the decade that made him famous, but in 1976 he was less successful and finished twelfth. Opportunity Knocks gave Floral Hall another performer in Mancunian comedian Ken Goodwin, and Luie Caballero is/was an actor and impressionist. Bert Weedon was a guitarist and a regular performer for the BBC. 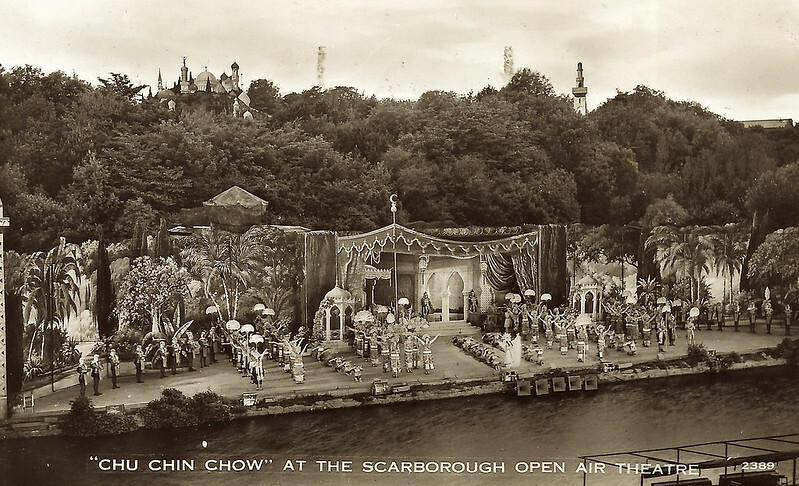 As the above selection of programmes demonstrates, Floral Hall hosted an impressive array of performers for nearly eighty years, but sadly closed in 1987 – there were insufficient funds to restore the building, and the heyday of the British seaside holiday was slowly slipping away. 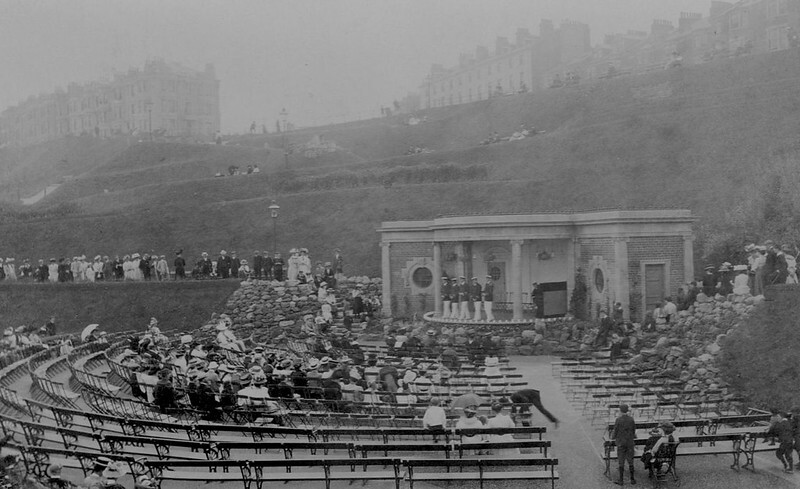 Who would have thought that a simple open air theatre from 1908 would last so long and provide so much entertainment? Do you remember Floral Hall? 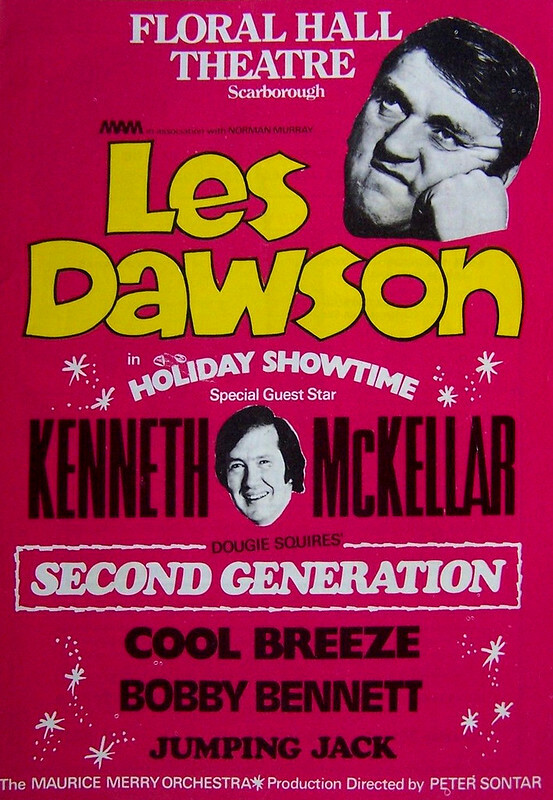 Do you have any old programmes, or recall the performers you saw? 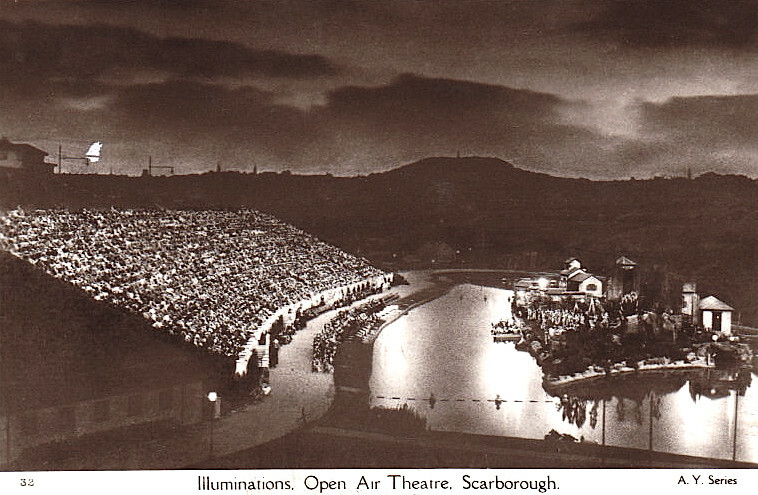 Stories From Scarborough has already introduced the history of Scarborough’s Open Air Theatre here, and discussed one of it’s productions – Carmen – in depth here. In response to requests from readers, here is a quick rundown of former productions, starting with Merrie England, the very first show to play at the theatre when it opened in 1932. 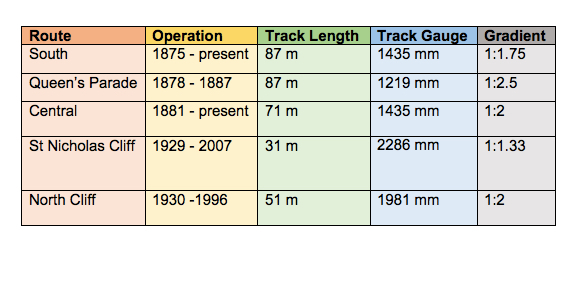 This was followed by Tom Jones in 1933 and Hiawatha in 1934. Carmen was 1935’s crowd puller, while 1936 saw a return to an old favourite – Merrie England. 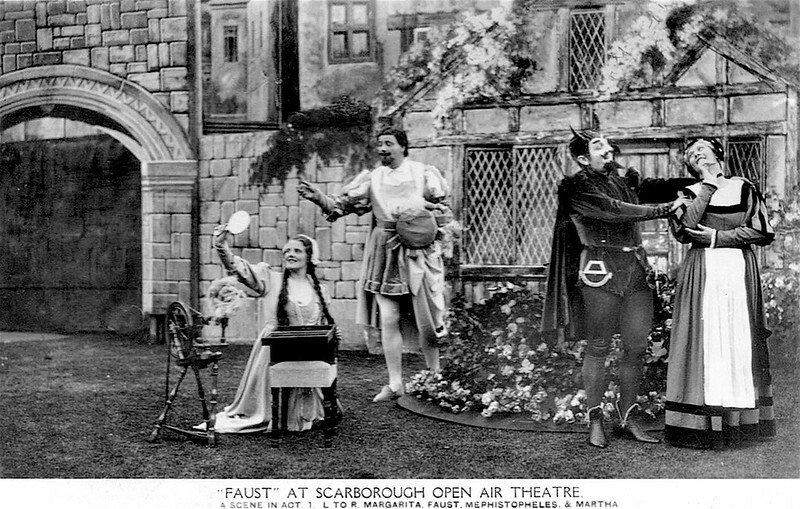 In 1937 the theatre hosted The Pageant of Faust. …and Bohemian Girl in 1939. You can read about Eileen Smith’s memories of participating in 1943‘s The Pay of the Pied Piper here, which was followed by A Midsummer Night’s Dream in 1944, and yet another Merrie England in 1945. 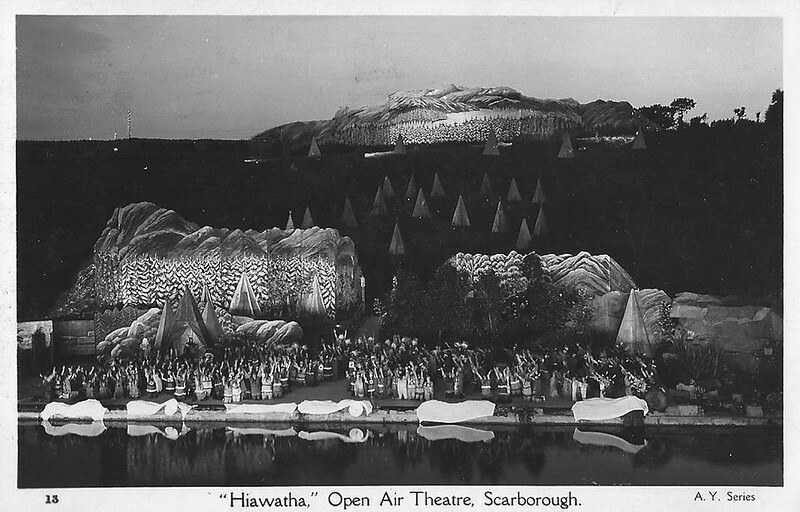 1946 introduced a new production – Maritana, while Hiawatha was 1947’s highlight – another repeat of a former production. 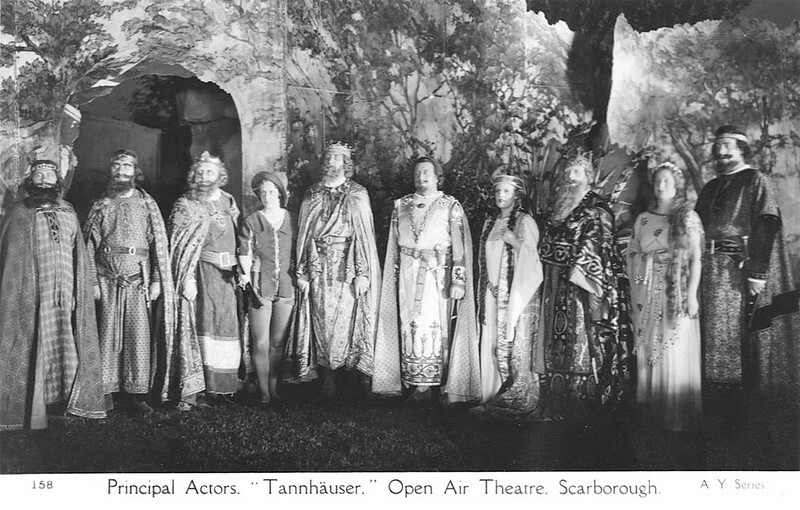 1948, on the other hand, saw the return of Faust (The Pageant of). 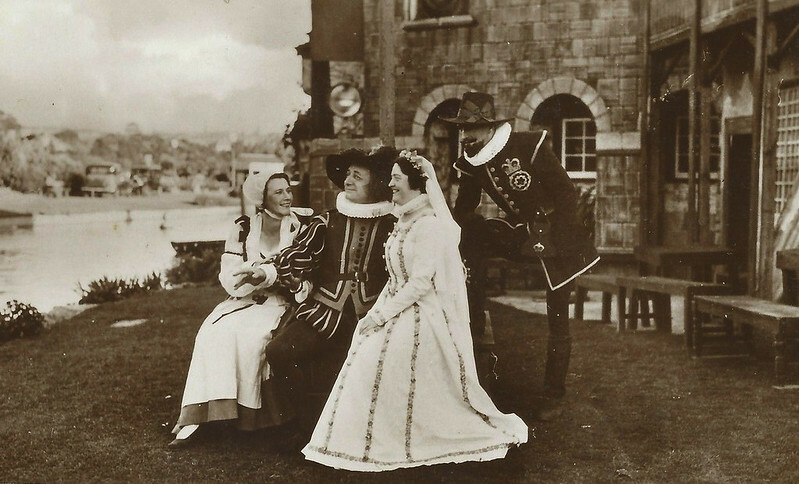 Robin Hood starred in the 1949 programme, followed by The Vagabond King in 1950 and Song of Norway in 1951. 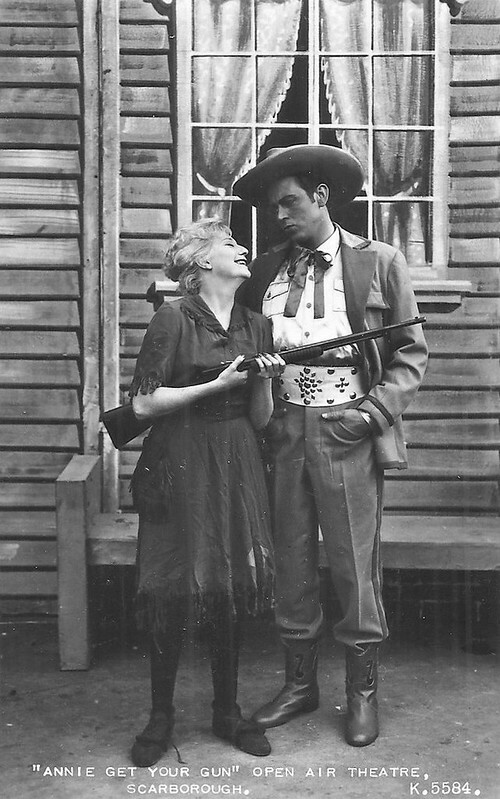 As was Annie Get Your Gun in 1953. While 1955 transported audiences to America with Oklahoma, followed by the rather grand King’s Rhapsody in 1956. 1957 brought White Horse Inn and Showboat starred in 1958. 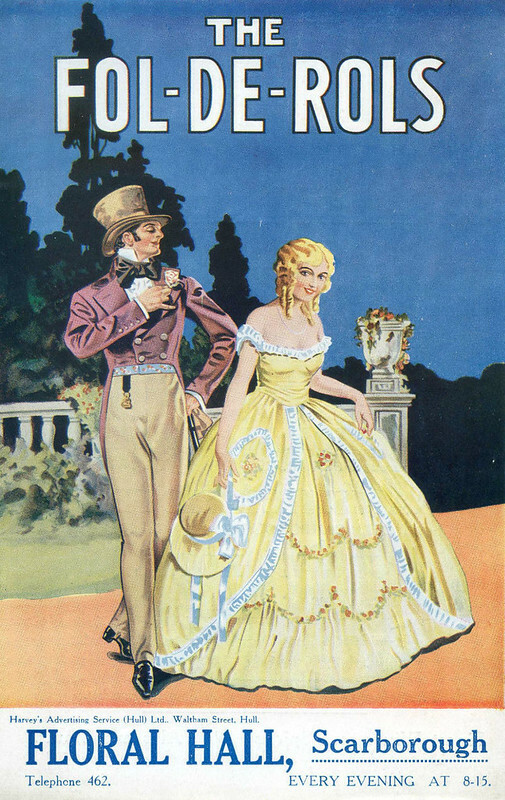 1959’s The Merry Widow was another well received offering. 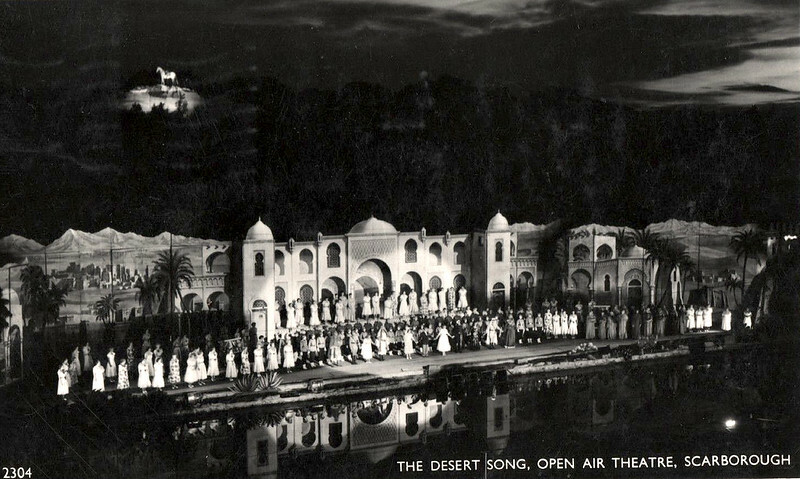 1960, 1961 and 1962 brought in further new productions – Summer Holiday, Carousel and Rose Marie respectively, while Desert Song returned for another run in 1963. After 1964’s South Pacific, The King and I ran for two years (1965-6) followed by Student Prince in 1967 and West Side Story in 1968. 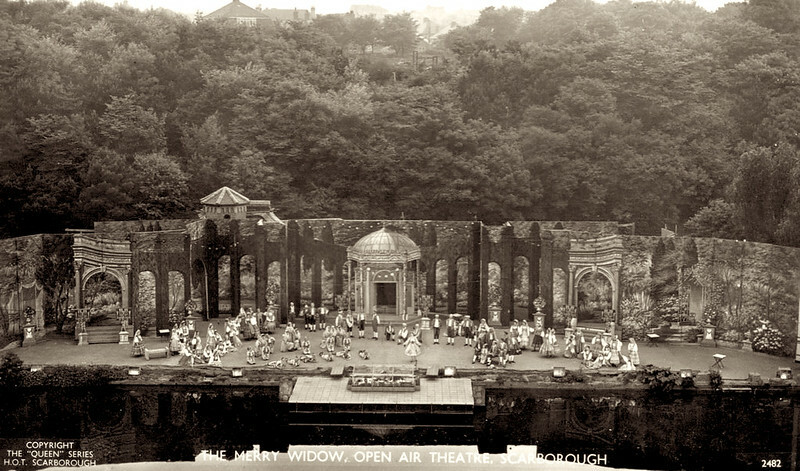 Although the 1961 film was a huge hit, West Side Story (the live musical) did not go down so well in Scarborough, and marked a period of gradual decline in popularity for the open air theatre. There would be no further musicals performed there after West Side Story. During the 1950s and 60s the theatre hosted It’s a Knockout on Wednesdays over eleven years. In the 1970s much of the island theatre set-up was demolished, and the final concert in 1986 featured James Last and His Orchestra. 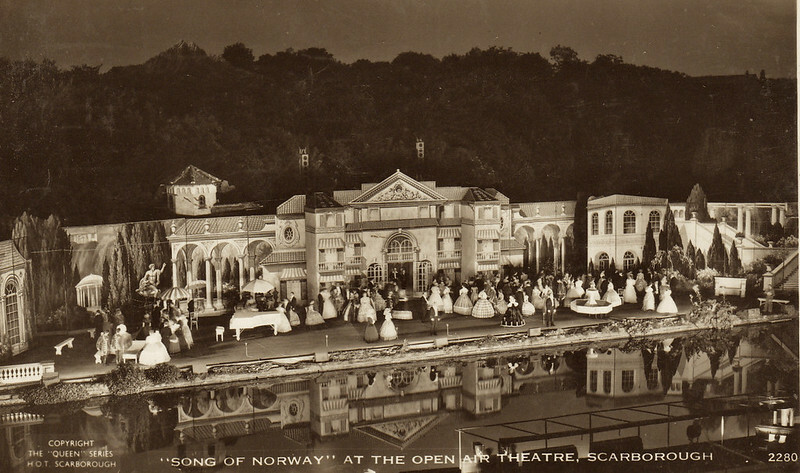 Redevelopment began in 2008 and today’s Open Air Theatre opened in 2010. Are there any shows missing from this list? Please get in touch or leave a comment below. 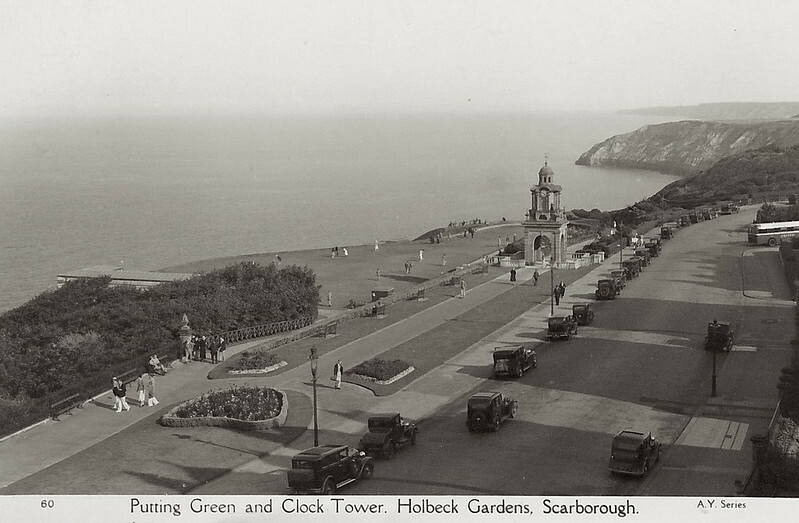 Between 1898 and 1907, a tall, rotating, observation tower stood on Scarborough’s North Cliff, not far from the town’s iconic castle. It was known as Warwick’s Tower. Revolving towers were a quirky fad of the late 1800s and early 1900s. 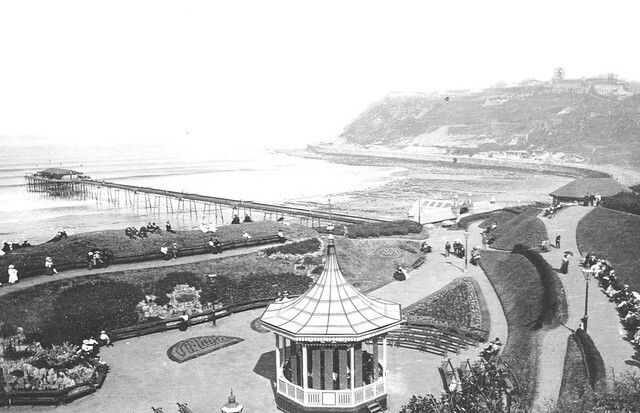 A number of Britain’s most popular seaside towns had their own, with an observation deck and views of the nearby landscape. 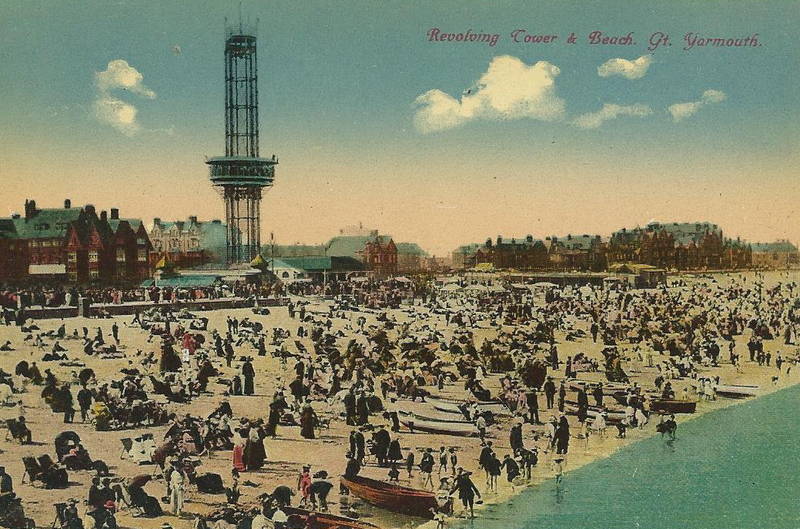 Morecambe, Great Yarmouth, Scarborough and others, eager to capitalise on the British seaside holiday boom, sought new and exciting attractions with which to tempt eager holidaymakers. But where did the idea of a revolving tower come from? The idea was originally conceived in Atlantic City, New Jersey, the U.S., where the first structure of this nature was created. American engineers and inventors sought out bigger and better ways to transport visitors into the sky, from ferris wheels at fairs and beaches to skyscrapers in cities. It was within this climate of ambition and adrenaline, that a Methodist preacher called Jesse Lake invented the revolving observation tower, after developing a fascination with machinery during his youth. Once built, the structure at Atlantic City was steel framed and 125 feet tall, with a pavilion below for amusements, games, exhibitions and waxworks. However, Lake never patented his design. In the late 1800s enterprising Englishman Thomas Warwick travelled to the U.S and came back with an American wife, and a burning ambition to reproduce Lake’s ambitious revolving tower. 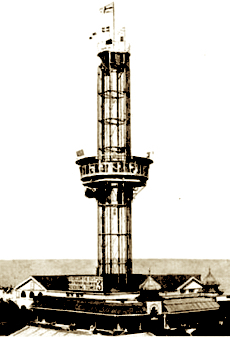 A London engineer by trade, Warwick cannily patented the revolving observation tower in 1894, ensuring that his company would be the sole provider of these strange structures across the country. The design was based on a moving platform, powered by a mixture of steam and weights, and raised via a steel cable. 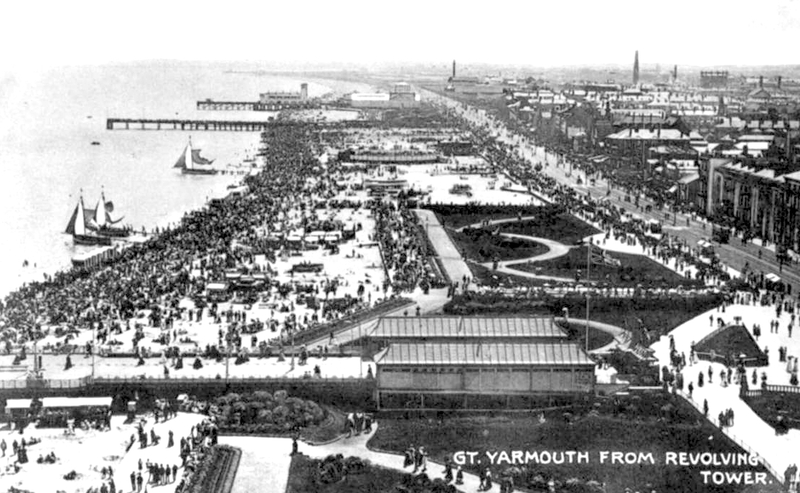 Great Yarmouth pioneered the British version in 1897, closely followed by Morecambe and Scarborough 1898. The towers rose 150 feet over the landscape and accommodated 200 visitors at a time. The towers encountered mixed fortunes – following the initial novelty, the Douglas Tower was destroyed by fire in 1900, only a year after opening. 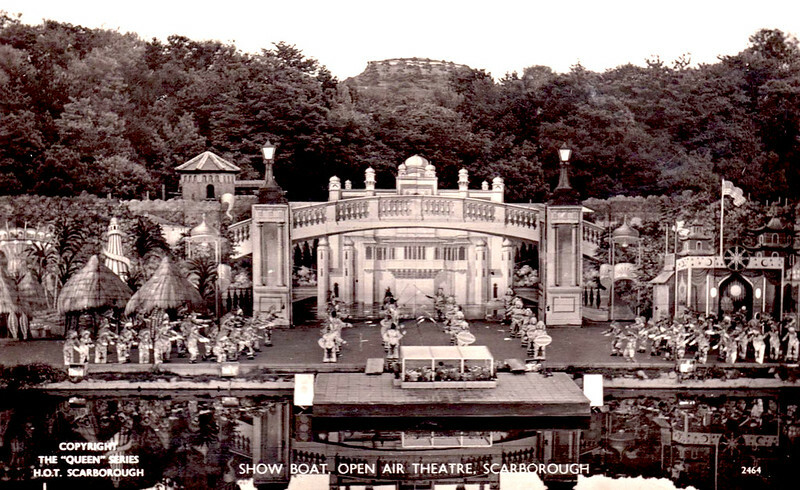 The Morecambe version was taken down when Warwick’s company folded in 1902, whereas Scarborough’s version struggled on for several more years. Great Yarmouth, the first revolving tower in the U.K., also proved to be the most resilient, with a local business formed specially to save it. It lasted until 1941, in spite of being plagued with faults during the interwar years. During WWI, regulations meant that the tower unable to operate after dark, leading to a loss of profits. 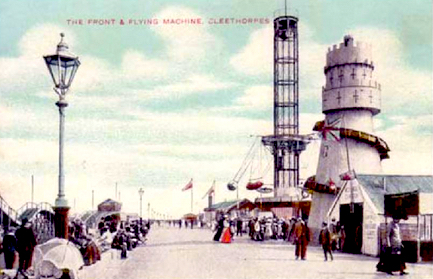 Before the tower at Cleethorpes succumbed to demolition, it was converted into a ride. Passenger cars, shaped like boats, where attached to the moving platform with chains, and operated as a fairground ride of sorts. But what about Scarborough’s tower? 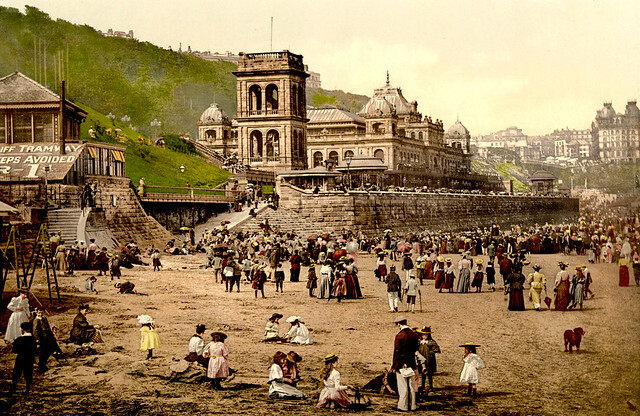 Warwick’s creation attracted controversy in Scarborough from the beginning – although initially popular it was soon deemed an eyesore, and fell into disrepair after Warwick’s company was dissolved in 1902. Finally one man – Alfred Shuttleworth – actively financed the demolition process, which began in 1906 and was finally completed by 1907, shortly after the nearby pier (which also experienced mixed fortunes) was destroyed by a storm in 1905. Easdown, M. (2012) Amusement Park Rides, Shire Publications, Oxford, U.K.
Randl, C. (2008) Revolving Architecture: A History of Buildings That Rotate, Swivel, and Pivot, Princeton Architectural Press, New York, U.S.
Woodhouse, R. (2013) The Scarborough Book of Days, The History Press, Stroud, U.K.